I was contacted this afternoon by Tommy Edwards who in 1963 won a local or regional Duncan Tournament. If anyone has one they are willing to part with, this would be an excellent home for it. I don't have an extra one, but The Earl may have one now that he got Don's collection. They appear sometimes on Ebay but you have to be patient as it may take a couple of years. The auctions often start around $150, but I have seen them sell for as low as $25. I don't recall one on Lassanke's collection auction video, but he must have had one: Auction of Daniel Lassanske's collection. By the way, there is time until the end of next month to place your bids. 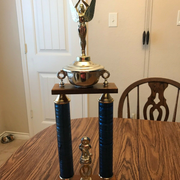 There are none right now on Ebay, but I found an interesting item: the 1971 Duncan yo-yo trophy, second place, for the Southern California Contest. It's sold by the wife (widow?) of the guy who won it, and she is asking for $1,600. We know that Duncan also had a spintop contest in SoCal that year, as proven by the contest kits sold on Ebay, but I have no more information of who won, etc. Yes, he is alive! I asked him. He wasn't enrolled in the spin top contest. He does remember it happening because his Dad taught him how to do spin tops as he was a champion in Detroit in the early 50's. He recalls the spin top contest did go all the way to finals. The finals for the yoyo and spin top contests were in Garden Grove California. He placed in 1970 and 1971. 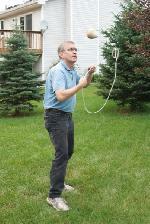 In 1971 he believes there was a spin top contest at the same time the yoyo contest he was in was going on. Hope that helps. This confirms that the 1971 SoCal Duncan spintop contest promoted by the parks and recreations kit that several of us have gotten on Ebay, really happened, went all the way to a final and where the final was. It also tells us that there were spintop championships in Detroit in the early 50's. Good information. So there must have been some hotbeds of top spinning action in those locations at some time.